The shapes of the Länder territories in Germany were very complicated. There was hundreds exclaves and enclaves all over the place to the point it became ridiculous. Notably the shape of Prussia, which covered most of the territories of northern Germany, had many smaller enclaves of other Länder in its territory, and a small exclave in southern Germany which was very distant form the rest of Prussia. The Thuringia region was also incredibly complicated, with a mix of Prussia and various other states all over the place. 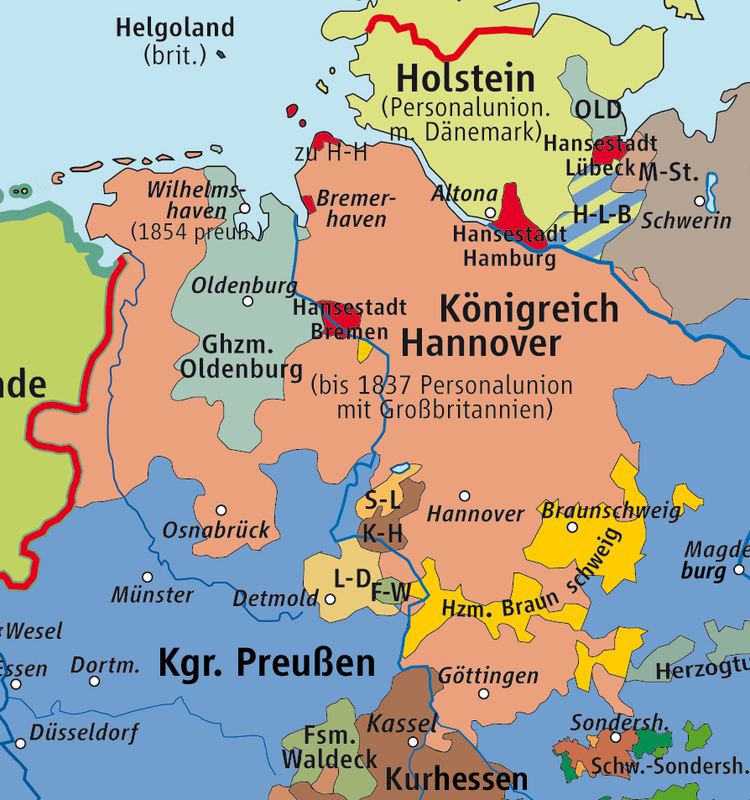 Why was the division of territory within Germany so complex? 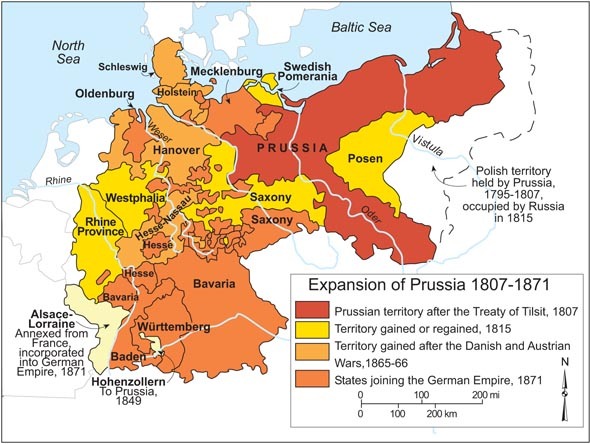 Since Prussia was pretty much doing what it wanted in Germany, why didn't Prussia just take over those tiny states that are entirely encapsulated within it, to simply cover the entire north Germany? Why was this changed after WWII, and, why wasn't this changed after WWI? As CsBalazsHungary correctly points out, this was a legacy of Germany's roots as the Holy Roman Empire. As is well known, the Empire remained highly decentralised and fragmented pretty much right up till its demise. Due to the feudalistic nature of the land holding, centuries of inheritances, sales/purchases, and swaps led to extremely irregular borders between the various Imperial territories. Note that this was not unique to Germany by any means. 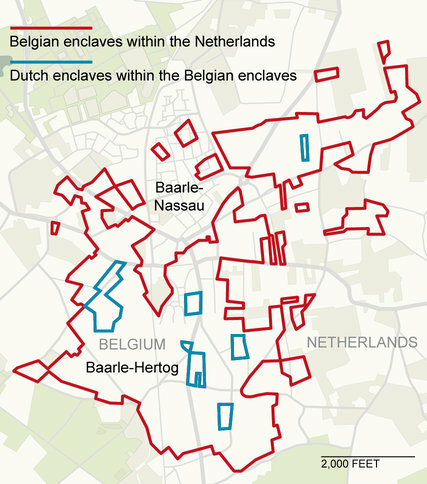 The Dutch-Belgian border at Baarle-Nassau and Baarle-Hertog is another famous example of ridiculous borders courtesy of a long history of feudal transactions between Brabant and Breda. The only difference here is that the Kingdom of Netherlands split into two different states, modern Netherlands and Belgium. The German Empire was to a large degree federal, although thoroughly dominated by the Kingdom of Prussia. Its constituents, while greatly altered from the last days of the Holy Roman Empire, remained shaped by its convoluted internal demarcations. A substantial consolidation had taken place in response to the extreme shock of disastrous imperial losses in the Napoleonic Wars, in the form of sweeping territorial transfers (largely at the expense of the imperial cities and ecclesiastical princes). This haphazardous process did not really rationalise borders. Similarly, Prussia's expansion occurred against this backdrop of an intricate mosaic of convoluted territorial entities. It received much more than it lost from the Final Recess's redistribution, and picked up major territories after Napoleon's downfall. And just before German unification in 1871, Austria's allies were annexed into Prussia after the latter's victory in the Austro-Prussian War. That small strip of land in southern Germany was Hohenzollern-Hechingen and Hohenzollern-Sigmaringen. Both fell to revolutionary forces during the March Revolution. Their last ruling princes both ceded their principalities in late 1840 to their relative the King of Prussia. In all of these processes, inherent diplomatic and political concerns meant that irregular demarcations were often preserved. For instance, the Kingdom of Hanover surrounds the Duchy of Oldenburg, which also had exclaves next to the Duchy of Holstein. Hanover and Holstein were incorporated into Prussia in 1866, but Oldenburg was a Prussian ally and hence maintained its nominal independence. This unnecessarily complicated border thus made it into the internal divisions of Imperial Germany in 1871. This stands in contrast to military conquests, for instance the Partitions of Poland, which were more conductive to producing cleaner borders since the negotiators were working off a relatively blank slate. It wasn't until the devastation and utter constitutional upheaval of the Second World War that the German states were reorganised under the Allied Occupation. I'll try and address your questions separately. Source is mostly personal experience; I used to live in the city-state of Bremen, as well as in the capital of former Prussia, Berlin. You also didn't mention which time period you are talking about; some things have changed dramatically over the centuries. Some things also were different in different parts of Germany, so a completely universal answer is not possible. Also please keep in mind that even the concept of Germany is somewhat fuzzy and has shifted dramatically over the centuries. Others have already offered several explanations. An additional factor was that land ownership, on all levels, was largely hereditary. Territories were often split among children, and merged through marriages. This extended from the highest level of royalty down to the individual acreage of farms, and frequently caused very small fractured farm ownership. This was not universal, though; there also was the opposite phenomenon: a father might want to keep the farm together and give it all his eldest son. This left the remaining children poor and without prospects, and was one of the main drivers behind emigration to the USA. The other answer to your question is that, to some extent, the question really never arose. Keep in mind that the world in the era you are talking about was very different from today's world. Think about why you are even concerned about territorial integrity. Pretty much every reason I can come up is something that matters in today's world, but wouldn't have mattered in the 16th or 18th century. People for the most part didn't really travel very far (in part because travel was slow and expensive, and in part because most of the land was wild and had no effective police force. Highway robbery was rampant). Territorial integrity beyond the next village held very little interest. Borders really only became a major impediment to economy and travel in the late 19th and early 20th century. As a personal speculation, rather than part of your answer, having complicated borders may actually have been a benefit. As the saying goes "strong fences make good neighbors" and having an "international" border around your village might well make for a better fence than having just some township boundaries. Yet another factor is simply time. Looking at Bavaria and Prussia, Bavaria has a much longer contiguous history; Prussia was mostly empty land until the 1700s. Finally, the Lutheran reformation, followed by the counter-reformation, caused major territorial changes as individual towns or counties fell to the Lutherans, or went back to the Catholics. Did people living in all those different parts of Prussia really identify themselves as Prussians? Even if someone from the two neighbor villages would be from two other Länder, and someone from a very remote land would also be a Prussian? For the most part, the various states were more political entities than cultural ones. The idea of identifying with your country only started gaining traction with the rise of nation-states, starting with the American and French Revolutions. Culturally (and legally), people would usually identify mostly with their city, or the castle, or at best with their general region. Our English word "citizen" is derived from "city" and the German translation of citizen, "Buerger," refers to "Burg" (castle). A Buerger was somebody who was allowed to live in the village immediately surrounding a castle, and enjoy protection from the lord. Culturally, this idea still survives even today. I used to live in the city-states of Bremen, and it really didn't matter if you were a German citizen; you were considered a "foreigner" or at least not a local unless your grandparents were born there. Some other cities had more generous rules; in some, it was enough to live there for one year and one day to be considered a local. Same question for other enclaves, e.g. did people from southern Palatinate identify themselves as Bavarians? Sorry, I don't know the answer to that. My experience is more with Prussia. It was really not important for Prussia. Prussia had a big problem: too much land and not enough people. Trying to consolidate territory would require either extensive negotiations, or spending resources on a war. You'd need a good reason to do it, not just "because it would look better on a map". Even more so when there was no threat from these tiny states. Why would Prussia want to do that when they are really just more mouths to feed when they didn't have enough farmers to produce food? Also, several of these tiny states were very important economically as trade hubs (in particular, the Hanseatic cities). So while Prussia was generally hurting for people, they didn't necessarily want to encourage people from those cities to move to Prussia. Prussia did actively recruit people from other parts of Germany, and famously declared religious freedom in order to attract French Hugenots after the revolution. There are actually interesting topics and bits of trivia about this lack of people, but they would be too far off topic for an answer to your question. These things weren't "changed" deliberately. Rather, historical events caused new borders to be drawn with little regard to existing borders. It just happened that many of the former enclaves and exclaves were "paved over" (many still survived, though). WW II simply was particularly catastrophic in that respect. The first push for territorial integrity actually was in the 19th century; the revolution of 1848 was a push for uniting Germany as one nation. That revolution pretty much failed, but did lead to the formation of the Second German Empire in 1870. The outside borders of that empire were comparatively clean. WW I did not cause too much internal territorial changes simply because Germany continued to exist as a nation. Of course, Germany did lose some territory along its borders. The reason WW II made more dramatic internal changes came about because Germany as a nation was divided up; one could almost argue that it ceased to exist and was re-created from scratch. That had many consequences. The most obvious one is that the major cultural divide in Germany used to be between North and South. After WW II, the major cultural divide was between East and West. Another consequence is that many of today's state lines reflect lines of allied occupation. The most obvious example is the line between the 5 Eastern states and the 11 original German states, as well as the western border between Berlin and Brandenburg (even the fact that Berlin is a separate state is due to the Allied occupation). The border between Germany and Poland is similarly shaped by Allied forces and has no historical background whatsoever. Another example is, again, the cities of Bremen and Bremerhaven. The reason they are still a city-state is that Britain occupied most of northern Germany, while America occupied southern Germany. That did not give America a sea port. Thus, Bremen/Bremerhaven was American-occupied territory, rather than becoming incorporated into the surrounding British Lower Saxony. The shape of "all" European feudal states was as complicated as that of Prussia's as late as the fifteenth century, that is, up to 1400-1500. So the real question is why was Prussia's shape so complicated as late as the nineteenth century, that is four centuries after "everyone else." The answer is that Germany, generally, and Prussia, particularly, was late in uniting. France was united after winning the 100 Years' War in 1453, Spain was (mostly) united after the marriage of Ferdinand and Isabella, and the victory over the Moors in 1492, the Netherlands won independence from Spain early in the 17th century, the United Kingdom (in its present form) came into being in the 18th century after the absorption of Scotland, and "pacification" of Ireland, etc. Germany did not unite until 1871, with Prussia leading the way, which is why some of the feudal divisions dating back to the Middle Ages were not erased until then. Actually, "Prussia," consisted of numerous parts. The namesake eastern part was colonized by the Teutonic knights in the 13th century. It was acquired by Brandenburg, the area around Berlin (through marriage) in the 16th century. 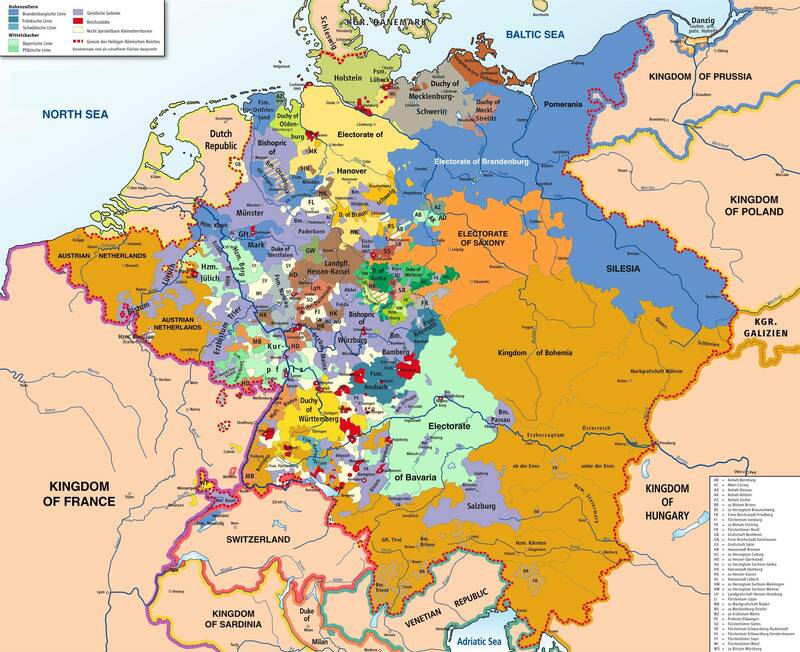 There were Rhineland territories that were added to Prussia early in the 18th century; not to mention Silesia and conquered Polish territories between 1740-1795. Each region (and many sub regions under them) had its own distinctive culture. It was only by a common "citizenship" that they were bound to the others, and were differentiated from non-"Prussian" Germans such as the Bavarians, or others. Not the answer you're looking for? Browse other questions tagged political-history germany political-geography prussia or ask your own question. Who inherited from the pre- World War II German states? Who considered themselves as “Prussian”? How long was the Treaty of Versailles intended to be in order? Why were the Istein and Schliengen enclaves transferred from Switzerland to Baden?